Summer 2016 - To Do List will be a series of blog posts to help get everyone ready for school in September. The fall season is almost upon us and the deadline of JULY 29th to hand in fall paperwork is even closer. I wanted to reach out to explain exactly what 4 things are needed in order to be cleared for participation for the fall season. If you are not participating in a fall sport you can disregard this email. The following links contain the files and information required for participation. These forms must be completed in full, and without errors or they will be returned for completion. Fall Clearance List This should contain just about all the information you need in order to be cleared. Below are some notes and other information that may be helpful if you still have questions. 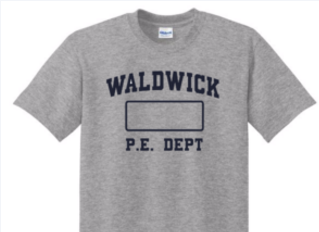 ***Important*** It is a mandatory requirement for all HS Students to wear at least the WHS PE Department T-shirt and Shorts. Failure to do so will penalize a student's overall PE Grade. All orders should arrive to the High School by the last week of September. No student will be penalized until the orders have arrived, until then the PE Dept. will allow the students to change into any appropriate top (t-shirt) and bottom (mesh/ athletic shorts) that are grey or navy.